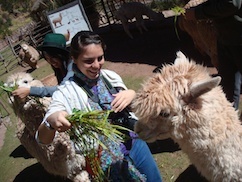 Befriend the wildlife and travel to Machu Pichu while learning about Incan civilization in the Andes. Begin your exploration with the Peru Field School 2012 Video featuring our student Ann Harvey! This program takes place during four weeks in July in Lima, at the Pontificia Universidad Católica del Perú (PUCP). Founded in 1917, today it is among the thirty most important universities in Latin America and occupies the first position in Peru. Students will study Spanish language, Spanish language conversation and Peruvian culture courses. The program offers visits to the main cultural attractions in Lima to provide the subject of discussion in the language course. Students can stay at Peruvian families’ homes where they will find every amenity they need and receive breakfast and dinner. Students must make the arrangements. The PUCP will provide the students with a list of homes and contact numbers that are recommended by the university. All classwork is conducted in Spanish. Students must have completed SPAN 2020 X/Y.06 or equivalent with at least a standing of B-. Dalhousie University grants 9 credit hours to those students who successfully complete their classes in Peru. Students will register via Letter of Permission and grades will be entered on a Pass/Fail basis. Courses will appear on the student's academic record as transfer credits. or contact Senior Instructor Magali Dam-Mazzi (magali.dam-mazzi@dal.ca) or by telephone at 902-494-6661.